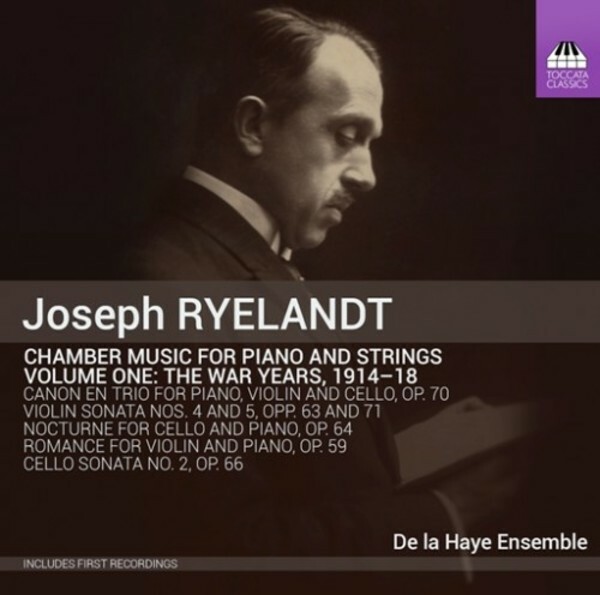 The Belgian composer Joseph Ryelandt (1870–1965) was a humble and reverent man, writing in 1940: ‘If it is God’s will that my works be propagated some day in the future, then it will happen’. Toccata Classics cannot knowingly claim divine intervention as explanation of this first release in a series exploring Ryelandt’s chamber music for piano and strings, but we offer this entirely unknown but thoroughly attractive repertoire as evidence of a long life well lived. The music is honest and sincere, sitting downstream from Debussy, d’Indy and Fauré; the melodies have a modal cast, giving them a timeless quality. The three sonatas on this CD here receive their first recording. An extensive booklet essay explores Ryelandt’s life in detail against the background of Belgian musical history. The De la Haye Ensemble – Hans Cammaert, violin; Daan De Vos, cello; Bart Meuris, piano – performs unfamiliar chamber music from the 20th and 21st centuries alongside the accepted masterpieces in the historical chamber-music repertoire. The Ensemble is committed to the performance of important Belgian works, part of its repertoire being new music by contemporary composers. The name of the ensemble refers to the symbolist painter Raymond de la Haye (1882–1914), whose young life was abruptly ended by World War I.